Disclosure: I received this product from V4L for review. This review contains affiliate links. 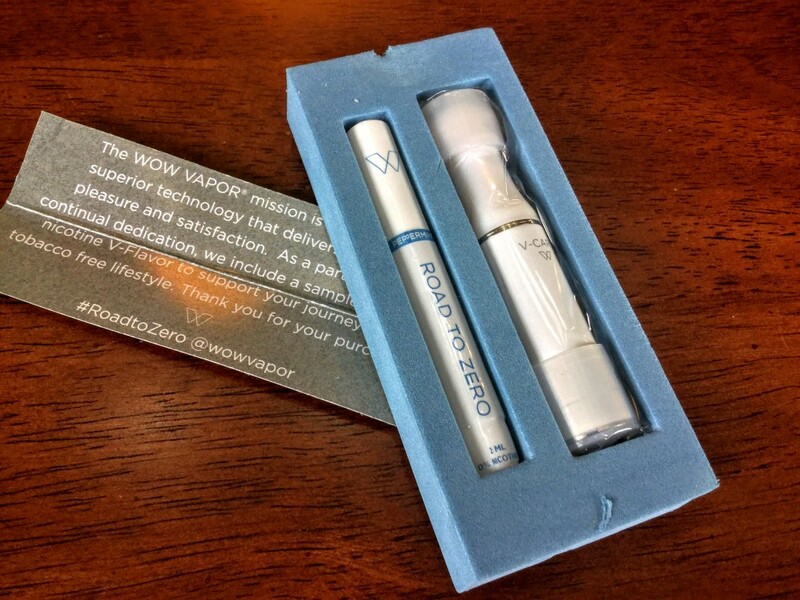 You can get the Wow Vapor V-Kit from V4L. Check their page out for coupons and discounts. 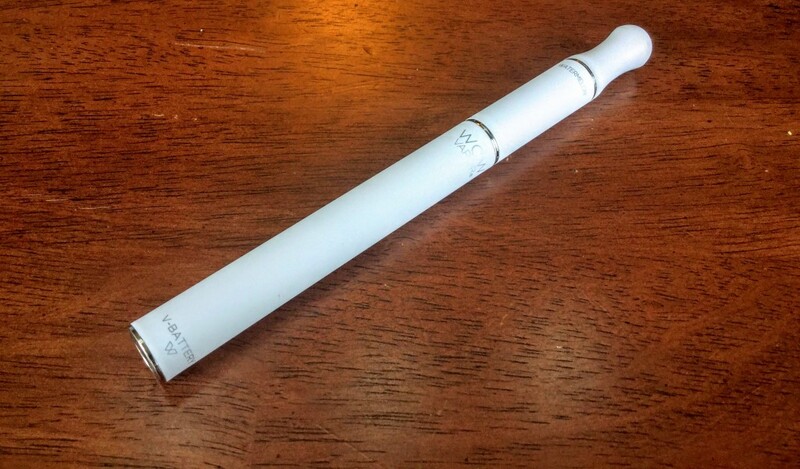 The Wow Vapor gear is based around the Vapor Zeus automatic battery and V4L’s new version 2 Smileomizers. While I’m not a fan of smoker-oriented vaping stuff, I absolutely loved the Zeus as an e-cigar, so this kit has potential. It seems that lately, brands targeting new vapers are moving up the hardware line to more midrange devices. 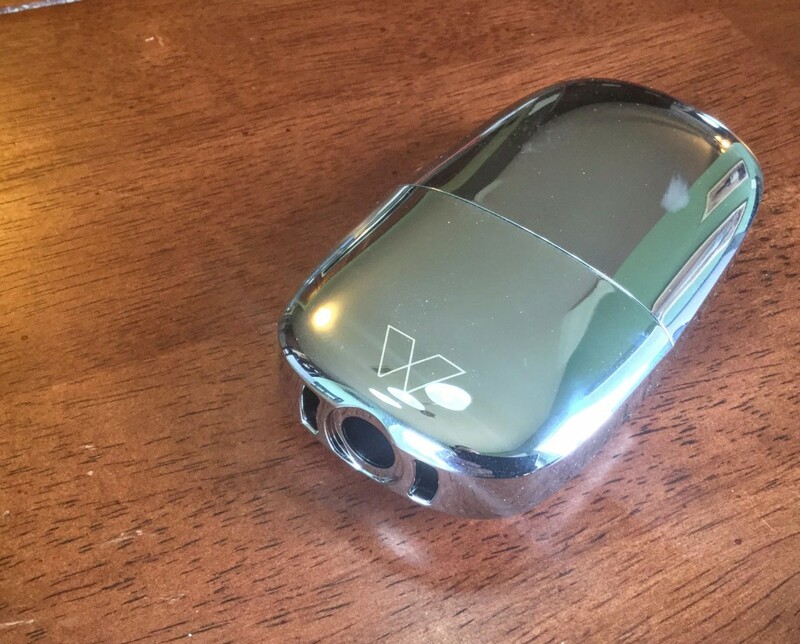 Not only is this the case with the V-Kit, but Vapor4Life is also supporting that with their web marketing of the product. While it’s still not marketed as a smoking cessation device, the company clearly wants to help smokers make the switch. It will be interesting to see how the campaign pans out. As they mention, the included e-liquid comes in 18mg but includes a 0mg sample. The same holds true for the sample e-liquid they sent along. I used to to dilute the liquid down from 18ml since I’m in the pretty low nic camp these days. Aside from the sample e-liquid, the kit comes with a pre-filled V-cart cartomizer, the automatic battery and a sweet chrome hard carrying case. The case is worth some mention in this review. It’s sort of a flat egg-shaped affair made of chromed plastic. Inside the case can handle a battery and a couple cartridges. A magnet ensures a solid closure without any latches that could be prone to breaking. At the bottom of the case is a cutout. When the battery is inserted bottom-down, the hole provides access to the battery’s built in USB mini charging port. I would like to see V4L make the switch from USB mini to USB micro that so many other vendors have done. It’s nice to have just one type of cable to worry about, even if V4L includes the cable and a wall adapter in the package. The battery, which allows pass-through vaping when it’s sitting on the USB cable is the star of the show. What makes the Zeus and now the V-Kit so spectacular is that the battery is a regulated 5 volt battery. Granted, it’s paired up with a higher resistance cartomizer, but the combination is designed to work well together. If the battery is the star, that makes the newly-redesigned V-Cart is the supporting lead. They’ve done quite a bit to these plus sized cartridges since my last review. There’s improvements to the coil, The core wick is also now made of cotton which helps all the high-end sub ohm tanks work out so well. There’s still polyfill in the cartridges to hold the e-liquid that V4L claims to have improved, though I’m not quite sure how. Whatever they’ve done, it works. Vapor production on the V-Kit is outstanding. It’s not quite the dense clouds you get out of proper tanks and crazy advanced setups, but it’s really good for a cartomizer-based solution. The combination should suit new vapers, and even those who prefer midrange gear to the insanity of sub ohm vaping these days. The awesome chrome carrying case is just a nice bonus at this point.